The Kpreps.com rankings are a collaborative effort from multiple media sources across the state and are released each Monday throughout the season. Let’s take a look some of the changes for Week Three of the Kpreps Top 5 rankings, powered by Pinamonti Physical Therapy. Perhaps no other final score from Friday night turned more heads around the state than Maize’s 40-28 upset of 5A’s top-ranked Salina South. South looked really strong in an opening week win over Derby, but could not catch-up to Connor Lungwitz and the Maize Eagles on Friday night. As a result, Maize enters the 6A poll at No. 5 and will face No. 4 Derby this week. Salina South falls from the top spot in Class 5A to No. 4. The top three teams in the Class 6A poll remain unchanged this week as Shawnee Mission West, Hutchinson, and Lawrence Free State all posted strong wins. Defending champion Bishop Carroll is back on top of Class 5A after a 49-0 shutout of Wichita North. Last season’s 5A runner-up Bishop Miege moves up to No. 2 this week after an impressive 24-15 road win at No. 5 Blue Valley. The Stags got another strong performance from junior quarterback Ryan Willis and forced five Tiger turnovers in the win. Blue Valley West enters the 5A poll at No. 3 after scoring two fourth-quarter touchdowns to beat St. Thomas Aquinas 24-17. Week Three will feature a matchup of ranked teams each coming off of losses as No. 4 Salina South hosts No. 5 Blue Valley. The Class 4A poll features a couple of changes at the bottom as a result of Maize South’s surprising 3-0 loss to Goddard-Eisenhower. Baldwin moves up one spot this week to No. 4 and Buhler enters the poll at No. 5. Baldwin beat Paola 28-9 in the fan’s choice for Kpreps Game of the Week, and Buhler turned two late interceptions into touchdowns to overcome Wichita Collegiate 35-28. At the top of the poll, Holton and Andale posted double-digit wins, while No. 3 Eudora defeated rival Louisburg by one-point for the second consecutive season. In Class 3A, the top three teams in the poll remain unchanged highlighted by Beloit’s 36-14 win over Smith Center. Sedgwick moves up one spot to No. 4 this week after beating Marion, and Conway Springs replaces Central Plains League rival Garden Plain in the poll after an impressive 21-6 win over Caney Valley. All five teams in the Class 2-1A poll posted impressive wins and three posted shutouts. Oakley was impressive in putting up 70 points in shutting out Sublette. The Plainsmen will get a test from unbeaten Phillipsburg in Week 2. The Panthers beat the Plainsmen 54-6 in 2012. Madison won the battle of ranked teams in Division I with two fourth-quarter touchdowns to top Marais des Cygnes Valley, 36-22. The Bulldogs remain at No. 1 in the poll, while the Trojans fell one spot to No. 4. Osborne replaces MdCV in the No. 3 spot after beating Hill City 64-18, and Atwood-Rawlins County enters the poll at No. 5 after posting their second consecutive shutout, 49-0 over Cheylin. The 8-Man, Division II poll remains unchanged as Baileyville B&B, Thunder Ridge, and Hanover posted big wins. 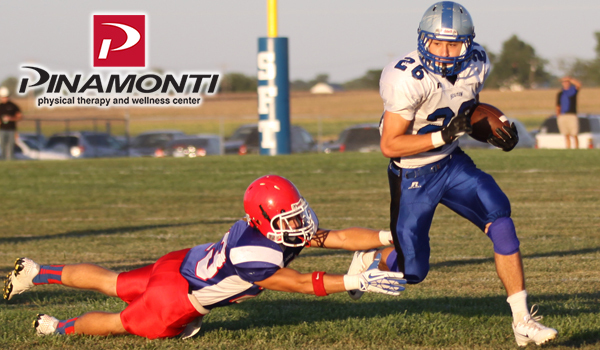 Sharon Springs-Wallace County edged a good Hoxie team 36-28 and remains at No. 4, while Victoria posted a big win over Central Prairie League rival St. John, 54-8. The Knights will host defending Division I champion Ness City in Week Three. Visit the Rankings page to view a complete list of the top five teams in each classification and how they performed last week.